The premium PU leather camera case with battery access is specifically tailored using high quality environmental leather for Fujifilm X-A20, X-A10, X-A5, X-A3, X-A2, X-M1 with 15-45mm lens for precision and coverage. Due to its rugged construction and tailored fit this case provides maximal external protection for your camera against bumps, dust, damage and shock. The soft internal layer of padded fabric keeps your LCD and lens safe from scratches, along with protecting your camera body. Humanized design, with battery access, you can access all peripheral ports, card slots, buttons, and the battery without removing your case, and attach it to a tripod with the case on. Convenience features allow rapid use of your camera when needed, taking that impulsive shoot is as easy as flipping the top cover open. Perfect for functional travel and outdoor use. 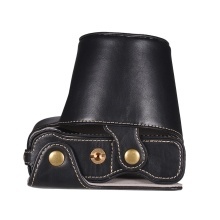 Vintage style, combining exquisite, ageless leather with rugged protection.